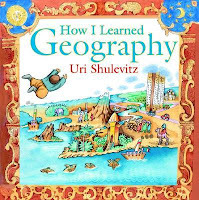 In my initial reactions to the Newbery medal and ALA Youth Media Award winners, I said I was waiting for a copy of How I Learned Geography and asked, "Did I read right, though? A family flees war and finds poverty?" Lesson learned: Don't judge a book solely upon any three sentence blurb found on Amazon. Yes, this autobiographical book is about Uri Shulevitz as a young boy of four or five fleeing Warsaw, Poland after the Warsaw blitz in 1939. Yes, the book is about how they fled east, settling in the city of Turkestan in the Soviet Union, what is now Kazakhstan, living in one room with barely enough to eat. But there's more. It's also the book of how a father's spur of the moment decision and the author's childhood imagination helped him escape nevertheless. That wasn't clearly stated in that bit I rushed to read on Amazon. All of the details listed above are from the Author's Note at the end. The story itself is much simpler. One day Father went to the bazaar to buy food, but didn't return until late. When he arrived, he announced, "I bought a map." No bread. No food. Only a gigantic map that, when displayed, filled an entire wall. After the boy gets over his initial disappointment and frustration, he learns...well, the book is called How I Learned Geography, isn't it? The boy travels the world via the map. He studies the fascinating names and creates a rhyming verse out of them, sort of a magic chant that transports him around the world. He travels to deserts, beaches, and mountains. He sees palm trees, fruit trees, and birds of all colors. He visits a rain forest and a temple and a large metropolitan city. All through the map. Yes, the story starts with war and poverty, but ultimately the story is about the power of a boy's imagination, and how it allows him to escape his difficult life, if just for a while. "And so I spent enchanted hours," he says, "far, far from our hunger and misery." 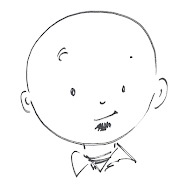 I am glad to find your blog and believe that good books encourage reading and readers. "How I Learned Geography" is a recent find and pick at our house. I am always on the lookout for a good book and encourage you to keep up the good work! Thank you for the kind words. I'll do my best to keep finding good books to share.